One True Media will announce today $5 million in new funding from Kleiner Perkins Caufield and Byers. 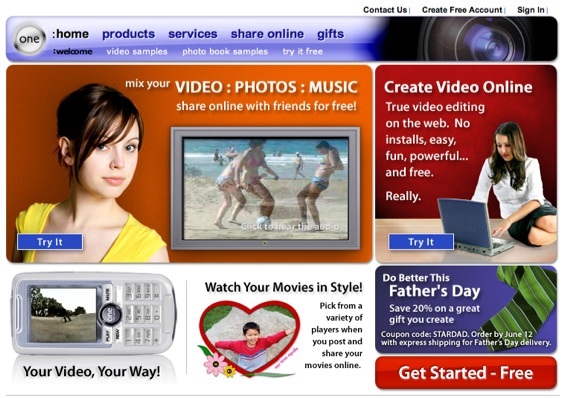 The service provides online video and photo slide show editing and sharing. One True Media’s service is highly usable, is well positioned to target families and online social network users but leans towards lock-in in its approach to the tension between the viral nature of online multimedia and it’s business interests. This tension is caused by the company’s business model, which aims to monetize data storage and the creation of hard-copy artifacts like DVDs and photo books. Given the company’s target demographics, difficulty exporting files to other systems or sharing without the creation of a simple account may not be a serious threat to the growth of the service. This is exactly the kind of high-quality system that could make web based multimedia editing and sharing a mainstream activity. It may not make the “data wants to be free” crowd happy, but it could show that Web 2.0 is for more than just geeks. Formed in February 2005 and launched in December of the same year, One True Media is headed by CEO Mark Moore and co-founder John Love. Moore is trained as a computer scientist, began his career at Oracle and has founded three previous startups. Love has an MBA and a background as an IT executive. Mark Fletcher, head of Bloglines until last week, is an angel investor and advisory board member. This week’s announcement that Kleiner Perkins is investing in the company means that One True Media joins a portfolio that includes WebMD, the women’s online community iVillage, Audible, Amazon.com, Google and more than 450 other companies. Founded in 1972, the Kleiner Perkins team includes Bill Joy, William R. Hearst III and many other notable figures. Kleiner Perkins partner Randy Komisar, a former CEO of LucasArts Entertainment, has joined the One True Media board. The strongest part of One True Media is the system’s usability. The flash uploader and drop down menus for selecting everything from clip duration to transitions are likely to provide just the right amount of creative control for the service’s target customers. The zoom-to-crop and simple pan functions might seem corny, but when it’s baby pictures or high school memories set to Coldplay on MySpace – that’s ok. One Coldplay song is available, along other 50 other songs by default and users can upload any Mp3 file for the soundtrack. The audio mixing function lets users drop the music or video sound to relative degrees, clip by clip, in case someone says something important in between guitar riffs. One True Media is focused on helping users create slide shows they will want to purchase on DVD (1 for $25, price lowered with quantity), turn into a printed book ($30 for first 20 pages) or store long-term online ($4/month). Premium subscription allows captioning, unlimited upload, 20 GB storage, personalized video players, up to 5,000 views per month and access to their files in MP4 format. Unpaid accounts can store files for 60 days. The company also offers video and photo scanning and restoration services. Access to a user’s files is limited to either premium subscription or purchase on a DVD. So if you were hoping to give One True Media a try for free , take what you created and leave the system with it – you are unable to do so. This may be acceptable to many parents and MySpace users. More difficult is the requirement that an account be created before a non-registered user is shown the code to embed a video in another site. Of course a page’s source can be viewed and the code needed is right there, but the ease of access provided by YouTube, for example is not there. Using the “email this slide show” link also requires registering for an account. Anyone can view a slide show without an account. Nonetheless, the company says it is seeking to harness the viral spread of online multimedia. If this happens, it won’t look like the Web 2.0 darlings to date in photo and video sharing. One True Media is a different kind of business and is clearly taking many steps to get users registered. More than 330 thousand users registered in the first six months the service was online. Behind extreme usability, One True Media’s partnerships with other online services is going to be the biggest factor in its future. The two biggest partnerships to date are with TypePad to offer a video player widget for bloggers and with Johnson and Johnson’s BabyCenter.com. One of BabyCenter’s features is a bulletin board with prominent links to One True Media’s co-branded BabyCenter video page. The company will be dedicating significant resources to developing and increasing capacity for similar partnerships as key to their growth strategy. I was very impressed with the usability and high-profile partnerships of One True Media. I like the subscription business model. Presumably, though, the company is hoping that a large number of people will buy DVDs or photo books. I imagine that most people comfortable today with manipulating photos and video online are not going to pay to have their slide shows burned to DVDs. This service is easy enough to use, though, that it may be adopted by far more people who are interested in purchasing such services. If more partnerships are formed with large, nontechnical online communities then the people who discover the service will find a strong system for making a compelling slide show. They may be just the kinds of people who will pay for such a service, despite current trends of free multimedia services online. That seems likely, and the future looks good for the partnership between Kleiner Perkins and One True Media.